I've gotten really into yoga recently. I find it's a great way to stretch out and relax after a day full of working and dreaming about changing the world. Also, yoga is so much about cleaning your body from the inside out, or saucha, in Sanskrit. And duh, I'll jump on any opportunity to clean. The yoga teachers always stress the importance of mindfulness - being fully aware of your every breath, move and action. It's only been a few weeks and I really feel like I've been improving in class - I'm more flexible, I'm en route to inner cleanliness and I figured out how to clean whatever is in the yoga studio. 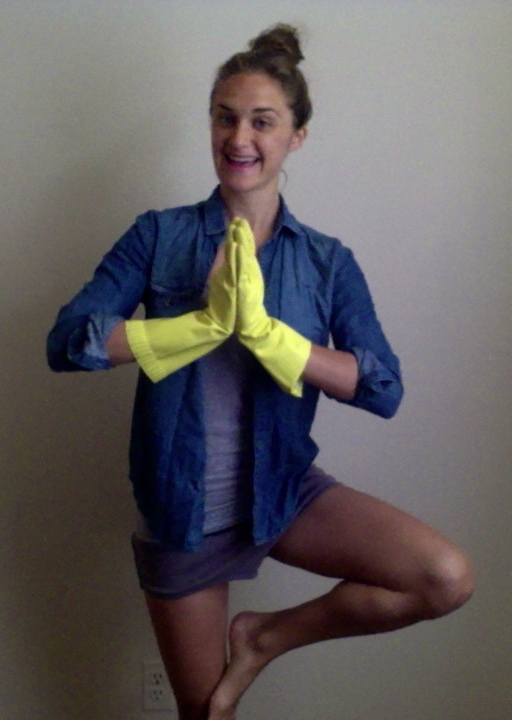 I've compiled a list of tips to keep clean before, after and during yoga. 1) Your mat gets sweaty. It gets dirty. It gets smelly. These Jo-Sha Wipes are awesome for a quick post-yoga mat wipe-down. They'll scoop up sweat and leave your mat smelling great - all natural! 2) To keep your mat in extra good shape, create a solution with tea tree oil and water (ten drops for a 6 oz. bottle of water). Rub some on with a towel to give your mat a delicious scent. 4) The flooring in my studio is cork which isn't the easiest material to clean because of its super absorbant nature. But most cork floors have sealant on them and can therefore withstand light moisture. So water mixed with a neutral cleaner (Murphy oil or vinegar will work) solution works well. Just make sure to wring out the mop well before using it on the floors. Although the cork is sealed, heavy water can still damage it. 4) A quick-dry towel is awesome for keeping sweat in check. They're light, small and dry really quickly (hence that clever name). 5) Yogis love incense and you may too. To keep your incense from creating an ashy mound, make sure there's something underneath them while they burn. Glass, tin foil or ceramic are good options because they won't go up in flames in case there's a mishap. And if you do make an ashy mess, make sure not to smear it around during cleanup. A vacuum is best to use to pick up the sooty bits. If you made an even bigger mess and the ash has ruined carpet or fabric, sprinkle baking soda over the affected area. Allow it to settle for 15 minutes before vacuuming it up. Then, moisten a clean rag with dry cleaning fluid and blot the stain continuously until it is removed. Thanks to my teacher, Nina from Bamboo Moves for helping me with this one.